Training in Luneta park with GM Rodel starts at 6’ish on Sunday’s. We set the alarm and got up before Manila woke up, or probably went to bed. Manila Marathon was organized today and that meant we had to a detour on our way to the park. It’s easy to assume the driver will try to do an extra mile or two to get more money, but Google maps is a great controller in that regard. As we got in the taxi this morning while having agreed on using the meter the driver asks for 100 pesos more than the meter will show. Katja just shut him down and we drove by the meter. Coming from karate it was a huge transition moving into the time-zone of the FMA (Filipino Martial Arts). Nobody really respect the time in FMA, each and everyone uses the term “Filipino time” as an excuse for not being on time. Here in Manila I can understand it as the traffic suddenly can double your traveling time. In Europe on the other hand that is really not the case. I write this because we were in the park at 6:30 for a training that was supposed to start at 6, and then GM came at 7:30. This time he had a more than valid excuse as he had been in a bus accident. Luckily he was unharmed, but there were several others that needed medical attention. He ascribed it to his reflexes from stick work that he had gotten his hands up in front and taken the impact through the arms and not then face. We had been doing some drills with his students before he came, and once again were taught some new drills. When GM Rodel showed up we all started a little more old school training. Warm up together in a tempo that would have impressed an East German. From then on it was Game On! We did stick drills, basic combos, empty hand and locks. At one point one of the students called “time” and it was now 11 o’clock. We were supposed to go from 6-9, but who cares about such details. We are very lucky to get in with this crowd. Not only was GM Rodel himself a great guy, but the senior students worked with us to get the basic of the system. We are very thankful for this. We also met an Australian guy from outside of Sydney today. He’s in the country training armed forces in close quarter combat, and wanted to pick up some tips from GM Rodel. He’s been training with this crowd before and was coming back for more knowledge. Phil, as his name was, is going to Batangas (a town south of Manila, the home of the butterfly knives) tomorrow to train with GM there. We will check with him in a couple of days how it’s been. He’s going to do public transportation down there, and we are thinking about vs renting a car and driver. Gerald was there also with his students, training just down from us. He introduced us to GM Rodel and was as always smiling and being nice. He and his students moved down to train with GM Espera’s students after all these hours. We were completely empty and craved food like hungry lions. We changed into something less drippy, as we were wet like newly bathed kittens. 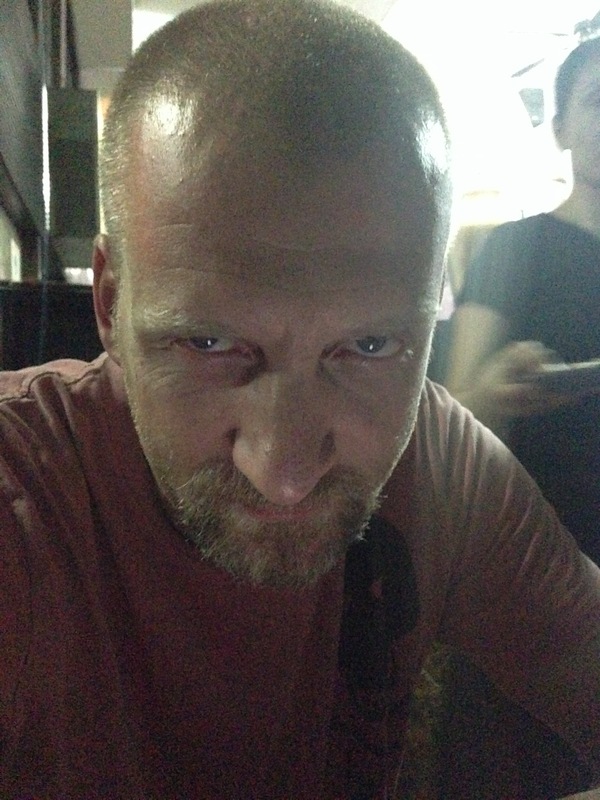 The heat and humidity in central Manila is tough when it comes to training for us Scandinavians. We started walking out of park and looked for food. We walked a little without finding anything we wanted, and then we just got in a taxi and headed for Makati and a restaurant we’ve passed all the times we’ve come this way. We found it alright, but the darn thing was closed. We started walking but NOW the sun was at zenith and we almost melted on the asphalt. We got another cab and went to another restaurant recommended by one of the yoga instructors, Pino on Jupiter Street. Very nice food. We ate quickly and headed out and back towards the hotel. It’s been forecasted with rain both yesterday and today, but it’s been hot and sunny all this morning. The clouds that moved in over Manila when we got out from lunch bode for a change in weather. The temperature dropped with at least ten degrees and the wind gusted in the streets. We got home via the coffee shop and the supermarket and just as we got inside it started to rain. Hopefully the guys in the park were not affected. Drinking water and getting back on our feet was the goal for the next hours. We had been in the park for almost 5 hours and even though we had been drinking water it was not enough. So replenishing water is our main concern this afternoon. We’ll go to an Indian, African, Mediterranean and Middle Eastern restaurant for dinner. We found it on our way back from lunch and it’s in decent walking distance from the hotel. We got in touch with an old acquaintance, Master Allan, that we met in Hinigaran in 2009 at the Presas beach resort. We spoke with him on the phone and will train with him tomorrow morning. We have requested training with the long staff, bangkaw, as we seldom get to do that in Norway. He’ll pick us up at the hotel tomorrow morning, which means yoga (on Katja’s birthday) may be cancelled, or maybe delayed to the afternoon. Now we’re at Ziggurat at the corner of Euphrates and Tigris and are waiting for our food. The restaurant offers a very wide menu, but the security guard recommended the Kebab. It smells good here now and we’ve just done another of “Things you never thought Humongen would like to eat” – Pita and Humus for starters. Now the chef had a little break and noticed that our beers were empty. He got us a couple of new ones and as I write this Katja calmly observed and informed me of a rat running along the wall and into the kitchen. Good thing we’re not easily scared. 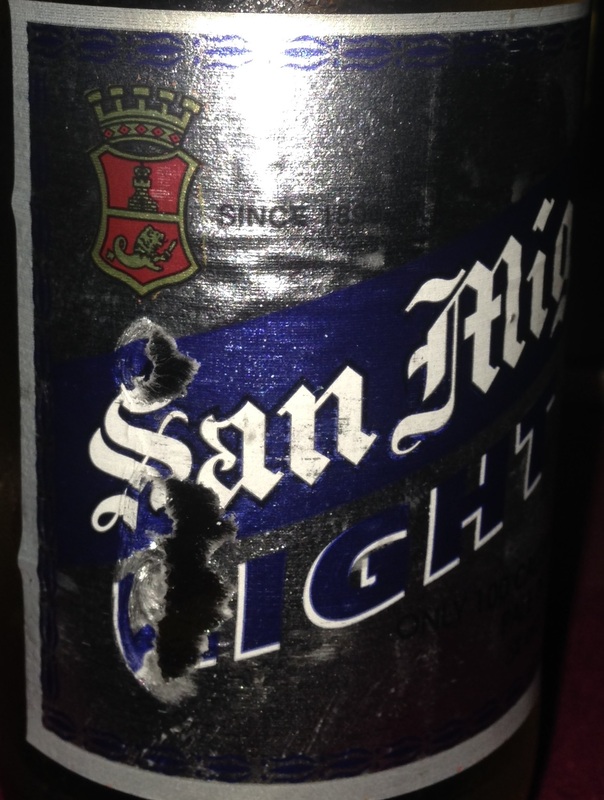 And take a look at this picture of the label on the San Miguel beer and this painted glass from the Cathedral of Manila. 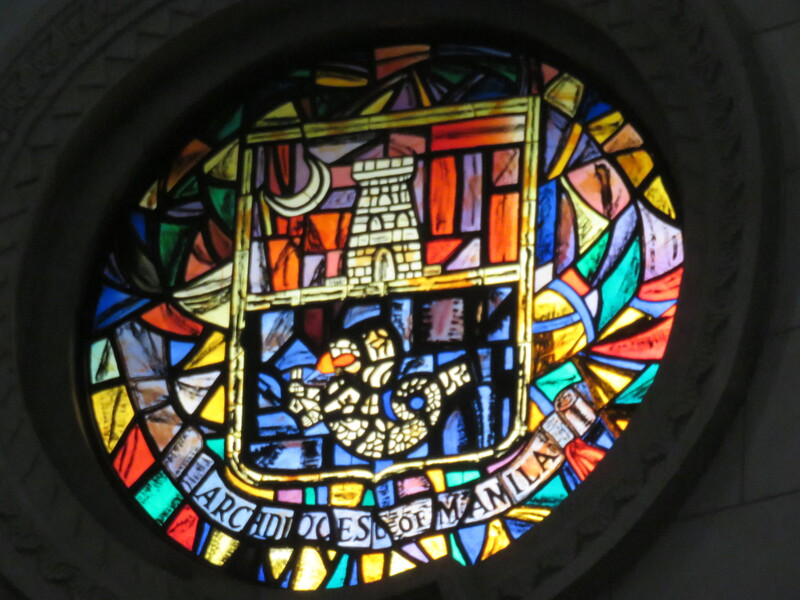 The same symbols is on both and it’s the city seal of Manila. The food was absolutely fabulous. Rats or not, who cares. The food made us smile, even though Katja constantly did the “rat-dance” on the floor to scare any rats. We walked in the back roads from the restaurant and back to the hotel. We live in the safest part of the city and walk around in these quarters with no fear. Still, just one or two streets of Makati Avenue you find bars with pretty adult or degrading content. There are loads of girlie bars with “dancers” and there are places offering “Midget boxing”. You can safely say that we’ve come along way in Norway regarding equality for all. Back at the hotel we took an episode on the TV and got to bed. The alarm is set early for tomorrow also, and of course there the BIRTHDAY!